Well after a colder than normal winter, spring has finally made its grand entrance with a spectacular warm day last Saturday followed by a fresh cleansing downpour of rain and then gusts of wind to blow away any leftover residual energy and to bring in the new energy of the season. This is the time of year when our thoughts turn to 'spring cleaning'. The most common usage of spring cleaning refers to the annual act of cleaning a house from top to bottom, however it has also come to be synonymous with any kind of heavy duty cleaning or organising enterprise on a personal, national and sometimes a planetary basis. In fact have you noticed that there seems to be a massive spring cleaning going on all over the world at the moment, particularly with the aftermath of Ike symbolically bringing with it the winds of change? No doubt we will all experience the ripple effect with the crash of so many investment banks and the faltering US economy. Change is the current catchphrase of so many politicians and change we will have, which after all it is the only constant in our life. There is no doubt that we are entering a period of turbulence which is all part of the natural cycle of life. The only way a system regains its balance is to let go of what is redundant; which includes life styles, monetary systems and hopefully governments. Once this takes place the system can rejuvenate itself thus allowing itself to recycle back up to a new evolutionary level of creation. It is comforting to know that everything in this Universe has an ending point and a starting point and everything IS as it should be. On Saturday 13th September Sol members gathered at the Bulli Community Centre on a perfectly warm and clear night to welcome in spring. Samantha and Charlene conducted the Ostara ritual which was beautifully constructed and delivered. It was a night that imparted a sense of love and peace as two ancient Greek Gods, Aphrodite of beauty and light, and Adonis of youthful delight were the hosts for evening. Each person was asked to enter the circle in truth and light and the elemental rulers were called to protect us on the night. A gift of a choice of an amethyst or rose quartz crystal was offered to each guest. Next we were taken on a meditation to meet Aphrodite and Adonis; we stepped through a curtain of beautiful pink light into a glorious oasis of spectacular gardens with flowers of vibrant colours. Adonis greeted us with a loving embrace and Aphrodite atop a white scallop shell rose with spectacular presence from the centre of a pool which was surrounded by beautiful maidens. With Adonis on the left and Aphrodite to the right, we walked through the gardens to admire their splendor. Aphrodite imparted her wisdom in a special place and talked a while, about life and love. Aphrodite then offered the advice that to truly love another, you must first learn to love yourself. 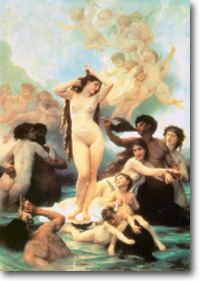 Aphrodite presented a goal that one could work on to achieve. The intent of the information received from Aphrodite was then placed into the crystal that was given as a gift. At the conclusion of the meditation a poem was read, then chocolate and juice were passed around the circle and we thanked the Ancient Gods for their presence and guidance. The circle was closed and the residual energy was then grounded back into the earth and forwarded to individuals for healing. We all finished the evening with our usual feast. More information regarding this circle and past circles can be found in our Book Of Shadows. Our next Full Moon Circle will be held near Engadine on Friday, October 10. Please contact us for further details if you would like to attend. 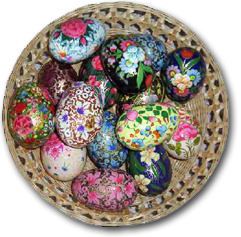 Ostara is a modern Neopagan festival. It is loosely based on several holidays which were celebrated around the spring equinox. The modern holiday does not have a strong relation to any known historical Pagan religious observation. In the northern hemisphere, the end of March is the focus for a number of religious and traditional celebrations. As the sun appears to cross the earth's equator on the 20th or 21st of March, entering the Zodiacal sign of Aries, day and night will be equal in length. This astronomical phenomenon is a day anciently revered amongst Pagan peoples. Their festivals included Alban Elfed, the Teutonic festival in honour of Eostre, Roman Hilaria Matris De�m, Welsh Gwyl Canol Gwenwynol ('Day of the Gorse'), the Christian Feast of the Annunciantion of the Virgin Mary (Lady Day) as well as Easter itself. The Wiccan Eostar (Ostara) Sabbat (one of the four lesser Wiccan holidays or sabbats of the Wheel of the Year) is a more recent addition to the Spring time festivities. Here in the southern hemisphere the spring equinox will fall this year on Tuesday September 23, 2008 at 1:44AM. Many southern hemisphere pagans choose to celebrate Ostara when it is seasonally appropriate, in September, rather than following the northern dates. Ostara, is a time to celebrate the arrival of Spring, the renewal and rebirth of Nature herself, and the coming lushness of Summer. The equinoxes are the balancing points in the cycle of the seasons, when the day and night are of equal length, reminding us of the harmony of the whole; yet the light is growing stronger by the day. The forces of masculine and feminine energy, yin and yang, are also in balance at this time. Buds of flowers and leaf, all manner of eggs and just-born life are celebrated in decorations and imagery as Pagans rejoice in the Earth's reawakening. Spring is a rousing of nature after the cold sleep of winter. As such, it is an ideal time to clean your home to welcome the new season. "Spring cleaning" is much more than simply physical work. It may be seen as a concentrated effort to rid your home of the problems and negativity of the past months, and to prepare for the coming spring and summer. The urge of spring is to do, create and bring in the new. At Ostara we also think of renewing ourselves. We renew our thoughts, our dreams, and our aspirations. We think of renewing our relationships. This is an excellent time of year to begin anything new or to completely revitalize something. This is also an excellent month for prosperity rituals or rituals that have anything to do with growth. Appropriate Deities for Ostara include all youthful and virile Gods and Goddesses, sun gods, mother goddesses, love Goddesses, moon gods and goddesses, and all fertility deities. 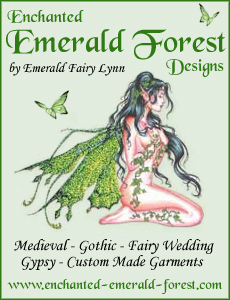 Some Ostara deities to mention by name here include Persephone, Blodeuwedd, Eostre, Aphrodite, Athena, Cybele, Gaia, Hera, Isis, Ishtar, Minerva, Venus, Robin of the Woods, the Green Man, Cernunnos, Lord of the Greenwood, The Dagda, Attis, The Great Horned God, Mithras, Odin, Thoth, Osiris, Adonis and Pan. Eostre [pronounced ESS-trah or Y'OSE-tree] is an Anglo-Saxon Goddess of the dawn, from whom "East" (where the sun rises) and "Easter" got its name - as the fertility goddess of the Northern European peoples, her legend was manipulated by the invading Romans - newly Christianised, they merged Eostre's spring legend to coincide with the time of Christ's resurrection. When the Saxons invaded Britain, they brought this vigorous Goddess with them and she was eventually adopted into the Celtic pantheon. She is also goddess Ostara, the maiden, in German mythology, celebrated when night and day are equal and balanced (the spring equinox for the northern hemisphere) and is the one for whom the Ostara Sabbat is named. She is seen as spring personified, a Goddess of rebirth, new beginnings, and fertility. Eostre comes into your life with her springtime message of personal growth. It is time to open to things in your life that facilitate growth, development, evolution. Is there a class or workshop you've been wondering if you should take? Do it now! Is there something new that you want to include in your life? Let it in now! Have you just gone through a period of stagnation and lethargy where nothing seemed to be happening? Let it go! Now is the time of growth. The Goddess says that wholeness is nurtured when you stretch. The stretching promotes your growth. As already explained, many southern hemisphere pagans celebrate Ostara in September, approximately six months after the northern hemisphere Ostara, Spring Equinox, and Easter. However, the symbolism of eggs, bunnies, hares, fertility etc are all associated with the Ostara sabbat whether in the north or the south so I thought it would be appropriate to explain how those connections are believed to have come about. The modern belief that eggs are delivered by a rabbit comes from the legend of the Goddess Eostre. Eostre was walking one fine Spring day and came upon a beautiful little bird. The poor bird's wing was badly injured and Eostre, feeling great compassion for the little creature, wanted to heal it. But the little bird's wing was so badly damaged that Eostre knew it would never be able to fly again even after she healed it. So, Eostre decided to help the bird by healing it in a way that would give it mobility and a little something more... She turned it into a hare! During the transformation, the hare retained the ability to lay eggs. 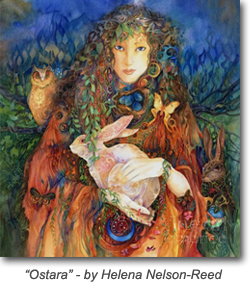 The hare was so grateful to Eostre for saving its life that it laid a sacred egg in her honor, joyously decorated it and then humbly presented it to the Goddess. She was so pleased and so touched by the hare's thoughtful gift that she wished all humankind to share in her joy. In honoring her wishes, the hare went all over the world distributing these beautifully decorated little gifts of life and continues to do so even today. Over time, the story has changed a little, with the hare becoming a rabbit, giving rise to the "Easter Bunny" instead of the "Easter Hare". It is a fact however, that in real life, hares nest in what is known as a "form" -- basically, a nest for bunnies. When the hares abandoned a form, it was sometimes taken over by plovers, which would then lay their eggs in it. The locals would then find eggs in the hare's form, which further explains the bunny/egg connection with Easter and perhaps the origin of the legend itself. The Green Man is the personification of the spirit of nature itself in its vegetation form; the living heartbeat in every cell of a plant, shrub or tree, and the divine essence of the seasons. He is the divine essence in the world of trees and flowers. He is health through the plants and fruits we eat. And he is the ongoing cycle of the year, the infinite wheel of life. 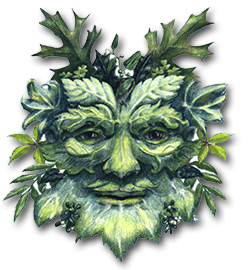 The Green Man emphasizes the fertility, regeneration and different life/seasonal phases as shown by the world of vegetation. He also represents the great solar god; the one that rises in spring, blooms in summer, declines in autumn and dies in wintertime, to be reborn the next spring again. He is the great fertilizing force of the land: he is the great masculine life-essence, the God, the Father, the Shepherd, the Lord of Light and the Lord of Darkness, and the other side of the receptive Goddess-energy of nature. Gardens bathed in sunshine, heavy with dew and bursting into life; everything during spring always seems clean, fresh and energised. Mind & Spirit: it has an overall uplifting and reviving effect making it valuable in states of stress, depression and nervous exhaustion. Body: it acts as a lymphatic stimulant and controls liquid processes. It is useful for treating water retention and its detoxifying and diuretic properties make it ideal for treating cellulite. It has a stimulating effect of the digestive system. Skin & Hair: helpful in treating acne, congested and oily skin. Synonyms:	C. racemosa, C.maxima var. racemosa. Place of origin:	native to tropical Asia & West Indies. Cultivated in California, Israel & Australia. Other species:	C.paradisi is a recent hybrid of C.maxima & C.sinesis. Description:	A cultivated tree, with glossy leaves & large yellow fruits. Characteristics:	A fresh, sweet and citrusy aroma. Method of extraction:	Cold pressed. History:	Grapefruit is believed to have been cultivated in the West Indies during the eighteenth century. It was known as 'Shaddock fruit' apparently after the sea captain who introduced the fruit to there. 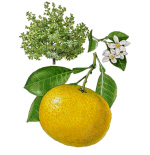 Chemical constituents:	A typical chemical composition of grapefruit is reported as follows: a-pinene (0.2-1.6%), sabinene (0.7%), myrcene (1.4-2.1%), limonene (86-95%), geraniol (0.1-0.2%), linalool (0.3-0.4%), citronellal (0.14%), decyl acetate (0.15%), neryl acetate (0.2%), terpinen-4-ol (0.08%). Blends well with:	Basil, bergamot, cedarwood, carrot seed, citronella, fennel, frankincense, juniper, geranium, ginger, lavender, lime, orange, palmarosa, rosewood, rosemary, tangerine, ylang-ylang. Properties:	Antidepressant, antiseptic, depurative, diuretic, disinfectant, stimulant, tonic. PRECAUTIONS:	Non-toxic, non-irritant, non-sensitising & non-phototoxic. Magical Uses: carry the blossoms to strengthen courage. The tea is said to help induce psychic powers. Medicinal Properties: Anti-inflammatory, diaphoretic, expectorant, lactation, emollient, diuretic, tonic. Medicinal Uses: Helps treat depression. It relieves fevers, bronchitis, and diarrhea. It's an adrenal tonic, an anti-inflammatory, and stimulates milk flow in nursing mothers. Many years ago I was going through a rough patch in my life and one night in my dream state a word came into my consciousness and it was Borage. I looked it up on the internet the next day and realized that the herb can be of assistance when one is feeling vulnerable and disjointed and when one needs courage to face untenable situations. 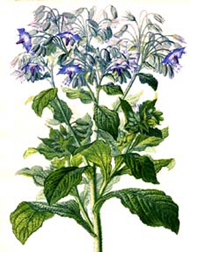 Borage is associated with Jupiter and with the Hierophant in the tarot deck. In ancient times Celtic warriors drank wine flavoured with borage to give them courage in battle, and it has always been considered it a very effective anti-depressant for the feeling of elation it induces. For courage, tuck a Borage blossom in your pocket before any stressful situation, or drink a tea or glass of wine flavoured with Borage leaves. Drinking Borage tea is also said to increase psychic powers. Borage has many medicinal qualities, the flowers or leaves are helpful for relieving the symptoms of bronchitis, and also act as an anti-diarrhoeal remedy. Externally, Borage leaves can also be ground into a paste and make a cooling and soothing remedy for fevers, sprains, swelling, and skin inflammations and irritations. Was Hael, and welcome once again to Ingress Astrology. This is now the third instalment and we are heading to the third Ingress of the Astrology calendar. We have moved out of the chilling cold and darkness - also deep reflection and introspection - that is representative of Yule. The Sun's arc is increasing across the sky as it makes its southward return to cross the Equator, and thus marking the Spring Equinox. The Spring Equinox is a significant time of year. Firstly, the Sun is rising and setting at a direct easterly point, making day and night equal. The spring flowers are starting to bud. Unfortunately, it is also a time when sinus and hay-fever are prevalent, by way of allergies to certain plants, pollen, and even grass! While the start of spring might not be much fun for allergy sufferers, it is otherwise a time to take advantage of the impending warmer weather and pursuing more of the outdoor activities. Spring is also a time of sowing seeds and planting. On a metaphorical level, spring is a time for incorporating new ideas and making plans for the future. We are coming out of hibernation, and either reacquainting ourselves with friends and family, or forming new friendships and making connections. In our Southern Hemisphere, the Spring Equinox falls on 23rd September of this year 2008, moving into 0 degrees of Libra. In going around the wheel, we have reached the second of the air signs, along with the third sign in the cardinal modality - simply to mean action and movement. This is where the role of Venus comes into play, in terms of commitment and marriage, diplomacy and the like. Venus has always been called the goddess of love, and this would still hold true. However, her values also extend to keeping the peace around her and ensuring that everything is in balance, like the scales that are Libra's glyph. In saying this, there could be a lot of peacekeeping - some might call it fence-sitting - at the expense of true expression and/or conflict resolution. It could also be said that Venus in the placement of Libra makes for manipulation that is likely to cause conflict. Many a Libran's innocent remark may be the catalyst for all-out warfare! Mars, at the opposite end of the Aries spectrum wouldn't need any great deal of encouragement with his lust for war and action! Returning to the ingress, we've looked at what Librans desire, which is essentially peace and harmony - especially in close relationships. What can also be important for these people is a need to put on and/or keep up an appearance. Librans are amongst the most social of all the signs, so holding dinner parties and behaving like gracious hosts would be second nature to these folk. A more extreme comparison could be the character Hyacinth Bucket (pronounced bouquet) from the TV series "Keeping Up Appearances." The first square out from Libra worth looking at is the sign of Capricorn. Ruled by Saturn, there is a need for solid foundations, rules and boundaries. It wouldn't be a particularly comfortable combination between these two. The Capricorn person relies on hard work, solidity, and public recognition for his labours. Capricornians are very ambitious usually, and very goal driven. The more sociable tendencies of Libra could frustrate them to no end, feeling as if their way is barred by some airy fairy hippy whose only interest is in peace, love and mung beans! If, however, they took their foot off the accelerator pedal once in a while, they would see their rewards bearing more fruit by remembering those people who are only too happy to support them behind the scenes in the first place. All work and no play makes for dull people in general, so it would be a great time to relax and enjoy more leisurely pursuits. The next noteworthy aspect is the opposition between Libra and Aries. It is well-known for the most part that the main attributes of our dear Martians - including myself - is to act upon our instincts and desires. While it's a great excuse for releasing excess tension and also to get things started, we must be mindful of what we are doing, not to act rashly and impulsively. Getting into hot water can result more times than not by not considering what we are doing or how we go about it. On the subject of opposition, it is a fortuitous time for all that male/female energy to play out in various ways. Opposites do attract, as the saying goes. Spring is in the air, there is a desire to court another, and in the animal kingdom there is a lot of nesting going on. The next square to consider is with Cancer. Probably the most outwardly emotional of all the water signs, they are either happy or unhappy with their lot. There is no imbetween for these people. The apple cart could easily be upset if they suddenly find themselves out of their normal routine - even if it's a once-off. Spontaneity, therefore, would be a perpetual challenge for our Cancer folk, who are the great homemakers and homebodies that ever exist. Another possible source of frustration is the Libran's desire for diplomacy and harmony, against a Cancer renowned for tuning into and expressing their emotions. The rulership of the moon that governs the tides and our intuition resonates very deeply in these people, so they would have the impression that Librans could be superficial. It wouldn't be the fairest of judgements, as Librans can be very clever and they do make the best peacemakers. Cancerians sometimes need to be a little less obstinate and perhaps give more thought to what they are actually saying. It can be difficult for others to be so in tune with themselves, while others still just don't act that way at all. The onset of the Spring Equinox will be upon us shortly, and if we haven't done so already, we need to be rid of the old in order to make way for the new. The ground needs to be re-tilled in readiness for the next lot of planting to ensure a good harvest. Likewise with any plans and goals that we have made for ourselves, we don't want to be held back with any loose ends or niggly issues. The days are also becoming warmer, and there are more opportunities in heading outdoors to enjoy our days in the sun. Amongst the Pagans, there are various celebrations to honour the coming Spring. One of these celebrations are the painting and decorating of eggs, to signify new beginnings and growth. The Germanic goddess Eostre is also honoured and revered as a fertility goddess and thanks is given to her. Whatever each of you do to bring in the impending Equinox, enjoy yourselves, keep safe and give thanks for another glorious spring. The next and final instalment will coincide with the Summer Solstice. Till then, I bid you Hael and farewell. On Saturday 13th September the Soul Searchers team conducted a second investigation of the Bulli Community Centre; the first was conducted on December 1st 2007. The investigations were conducted due to current staff of the community centre advising us of activity within the building as well as our own impressions of activity that we had picked up ourselves while conducting a Wicca workshop back in October 2007. The building currently known as the Bulli Community Centre and Library, at 328 Princes Highway Bulli, was originally built as the Bulli Shire Council Chambers. The official opening on 1 June 1929 was presided over by the President of the Council, who had also been a driving force behind the building of the chambers and of many other projects aimed at advancing and improving the township of Bulli. Waning Moon - 11.30pm, Weather clear. Janine - The energy in the lounge was quite oppressive. It was also quite unnerving having a constant sense of being watched. In the main hall I had the feeling of a presence standing behind me and a distinct sense that we weren't welcome there. Samantha - While we were investigating I did feel movement and notice shifts in light (even though the lights were out the environment seemed to darken and then lighten). At times I felt coolness on my body and what seemed to be a dark shadow moving about. This all mainly happened in the hall upstairs. I didn't really get anything downstairs at all, it felt quite calm to me. I felt very uncomfortable in the small area leading to the 2 office rooms upstairs and at one point when I walked into this area one of the doors rattled. I tried to manipulate the area to see if it was me walking in that did it but I couldn't seem to replicate what caused it and there was definitely no breeze present to have caused it either (unless of course one of the windows inside the room was open but I can tell you that they have always been closed when I have been there). So, who knows!! Jenwytch - Last night at Bulli Community Centre was a rather interesting experience. While I didn't actually see any spirits as such I did get a very strong impression of a little girl in the hall, which was substantiated by other people on the night. I was first aware of her when we approached the hall - I had the feeling she was looking out from an upstairs window, and was not very happy. I "saw" her (in my mind) as being around 8 to 10 years old, with long dark brown hair neatly parted in the middle and tied in pigtails. She was wearing a white/cream party dress which had a a fitted bodice, puffed sleeves and a gathered skirt which came just below her knees. She wore white/cream shoes with white roll-over socks with lace edging. Her pigtails were tied with pale lilac/mauve ribbons and the dress had a matching ribbon around the waist, tied in a bow at the back - I got the feeling it was the 1950's. When we were inside the hall I "saw" her mostly from the back view, as she was leaning on the windowsill looking out across the road, very sad and/or bored with whatever else was going on around her. I also detected a few sources of energy with my dowsing rods, both upstairs and downstairs in the building, which coincided with places that other people had independently sensed things as well - either with physical reactions, or with dowsing rods, pendulums or electronic equipment. We were all very aware of sudden temperature changes and a feeling of "movement" of shadows or entities around us, as well as a sense of heaviness or oppressive energy and the feeling of being watched. Moon Waxing near full - 10.30pm Moon in Aquarius, Weather - clear, Temperature 17 degrees, Geomagnetic field was quiet. Janine - During the Ostara ritual I noticed on two occasions a presence in the corner of the hall observing. When the investigation was commencing using the pendulum I ascertained that there were active spirits in the building but they wanted to be left alone. The investigation had a different feel from the last investigation, the first had an oppressive sense about it but this one felt quite empty. Kerri - Never having been there before I wasn't sure what to expect. I noticed people saying it felt different than it had before? I was immediately drawn to the upstairs hall between the offices, particularly wanting to go into the office on the left. The air in that area felt dense. I very much felt a masculine energy that I don't feel is grounded (as the energy eventually subsided) or maybe it went into hiding? The photos taken are interesting, particularly the the one of me standing with the large orb to the left. I actually felt something very strongly at that point which is why I asked Foxy to take a photo. Foxy - The hall felt very different from last time, it was very quiet and felt very empty. I only got vague impressions of something and not overly strong, unlike last time. Jenwytch - I also noticed the empty feeling in contrast to last time we visited the centre. However, at one stage I "saw" in my mind a man standing in the doorway of the lounge area, watching us. As everyone else at the time said they didn't sense anything I just assumed it was my overactive imagination and didn't mention him. Later in the evening, Amethyst started describing a man she could now "see" - her description, including his hair colour, matched very closely to the man I thought I imagined. Then today, while researching online the history of the building for this article I came across some early photographs of the Bulli Shire Council ...and there he was! Hmmm... coincidence? ...imagination? Definitely intriguing! The first investigation was undertaken close to dark moon thus more activity. The energy of the current aquarius moon sign had an affect on the activity. The Ostara ritual was conducted just prior to the investigation and could have a bearing on the activity and energy of the hall. The team's focus could have been distracted from the purpose of the investigation due to the energy of the ritual. Back in the 1970s I watched a film called the Stone Tape which had a major impact on my concepts of paranormal activity. The Stone Tape is a television play directed by Peter Sasdy and starring Michael Bryant, Jane Asher, Michael Bates and Iain Cuthbertson. It was broadcast by the BBC. Combining aspects of science fiction and horror, the story concerns a team of scientists who move into their new research facility, a renovated Victorian mansion that has a reputation for being haunted. Investigating, they learn that the haunting is a recording of a past event made by the stone in one of the rooms of the house - the "stone tape" of the play's title. Believing that this may be the key to the development of a new recording medium, they throw all their expertise and high-tech equipment into learning how the stone tape preserves its recording. However, during the process of their investigations, they try several experiments to eradicate the "haunted recording" only to reveal a darker, more malevolent layer. "In certain cases of hauntings and apparitions, some kind of local imprint, on material structures or places, has been left by some past events occurring to certain persons, who when on Earth, lived or were closely connected with that particular locality; an echo or phantom of these events becoming perceptible to those now living." Researchers speculate that the paranormal recording is laid down during times of high emotional and traumatic stress such as murder, grief or an important scene in someone's life. This energy can be stored for an unspecified amount of time in the surrounding building materials or the environment and then the replay is triggered by a number of variant factors such as the anniversary of the event, particular weather conditions, or the phase of the moon etc. Witnesses of this paranormal replay may experience these events differently and according to their own level of psychic ability, stress or emotional levels or even brainwaves. The replay can take a form of a full manifestation or even sounds such as voices or footsteps and may even be repeated like an ongoing loop. On 20th January 2007 some members of SOuL Searchers attended a ghost tour at the Redbank Range Tunnel (Mushroom Tunnel) in Picton, NSW. This tunnel was built in the 1860s to take the railway from Picton to Mittagong. When a new line was built it was left idle until the 2nd world war when it was used to store ammunition. After the war ended it was used to grow mushrooms, hence its nickname 'The Mushroom Tunnel' In 1916 a middle aged woman named Emily Bollard took a shortcut through the tunnel; unfortunately for Emily, halfway through the tunnel she was killed instantly and her body carried on the front of the train into Picton. In the years that followed, there had been many sightings of a ghostly apparition walking through the tunnel. Although skeptics maintain that there is a major problem with the Stone tape theory and believe that there is no satisfactory explanation as to how or why such a recording could take place. A large proportion of traditional centuries-old hauntings can fall under the banner of residual: the lady in grey who 'still is seen walking the path', the headless horseman that appears at midnight or the apparition that appears on the anniversary of its death. The concept of 'stone tape theory' is a neat way of explaining these phenomena. For many such individuals the theory is a valid one; if one has a belief that there is a connection between psychic events that becomes embedded in the environment then stone tape theory is a natural progression and requires no scientific justification. Part 2, Part 3, Part 4, Part 5, Part 6, Part 7, Part 8, Part 9. To view the entire movie, just click on the links above and use the "Back" button on your browser to return to this page after viewing each part. Each season interfaces with the next one, each season brings a new discovery, a new journey. Spring signals the beginning of the season of rebirth, the resurrection of nature. Having left the arms of his mother, the God ventures into the fields and woodlands of the rejuvenated world and is ready to take his place as Lord of the forest. Winter is truly over and the world has recreated itself in the image of life. Likewise, the Goddess recreates herself in her Maiden form and she explores the natural world that she has given birth to. With the budding of plants, the land is filled with fertility and becomes a time for the stirrings of the heart and a time to spring board new adventures. At the Spring equinox the days and nights are once again of approximately equal length. Throughout history this has been held as a time of celebrating new life, the resurrection of nature from the dead, and has typically featured fertility rites and merrymaking. Come on a journey of discovery into the magic of spring and learn how to use its energy to enhance your own magic and spiritual work. Connect with the Goat God Pan, who represents the force of life. 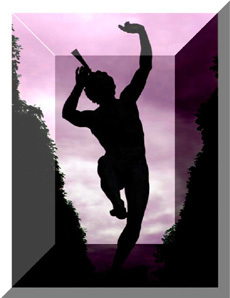 Pan is god of the forest and of shepherds, and was said to grant new life on earth every spring. The following PAN Full Moon Public Circle will be held on Thursday November 13, 2008. As advertised in the current edition of Spellcraft (page 31). MAKE IT HAPPEN: Beltaine 08! Click on the image above to find out more about this fantastic event happening in Sydney - please book in to ensure that you don't miss out and that we get enough people coming along to make it happen! We are in dangerous territory with the low number of bookings coming through and if we don't hit our deadline of reaching the minimum number of 55 people booking in and paying for their tickets by the 19th Sept then we will be forced into cancelling the entire event. See the website for more info on why we need a min number of people to attend. Hint: Currently, less than 20 people have booked and paid for their tickets! There is a long way to go ...but that also means, we have plenty of room if you want to organise a bunch of your friends to come with you! Bookings close 30/09/08 unless we do not meet minimum numbers by 19/09/08. An adults only (18yrs+) weekend gathering to celebrate Beltaine. 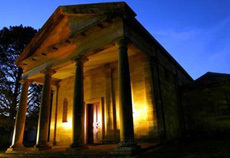 $140pp inc GST - includes all accommodation, catering and workshops & rituals. Please have a look at the website for more info. 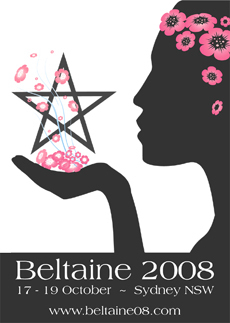 Keep an eye on the blog section of the Beltaine 08 website for regular updates. The Goddess Association In Australia (G.A.I.A.) 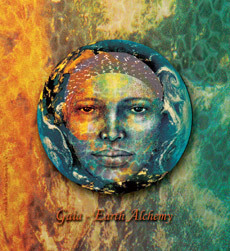 is delighted to announce the 2008 Australian Goddess Conference honouring Goddess Gaia and the celebration of the wisdom and magic that is Earth Alchemy. The conference will begin with an Open Day on Friday 10th October, with educational talks relating to Goddess, her history and spirituality, and the Goddess market stalls. We will also have the pleasure of hearing some inspiring musical offerings! A community ritual for both women and men will follow on the Friday evening from 6:00 - 8:30 pm. Our sacred woman's Journey then stretches over the two days of Saturday and Sunday, the 11th & 12th October, with a truly magical array of group ritual, keynote speakers, workshops and market stalls to delight your deep heart and deepen your connection to our sacred Earth. Earth Alchemy is the shamanic initiation of the rising Earth Serpent... uncovered in the secrets of the cave and around the labyrinth. This magic of the Great She is a part of every woman, reclaimed in order that she may return to her life- and heal. Be nourished, honour your connection to this land and our Great Mother, spinner of the web of life, love and enchantment. These events are mediumship demonstrations as the mediums pass Spirit messages to members of the audience. We would like to invite each of you to our 1st ever Samhain Festival for a magickal good time! Camping under the stars 23rd, 24th breaking camp by 1pm on the 25th. This Festival will have many great vendors offering a variety of quality merchandise, tarot readers, workshops, entertainment, astrology, healers, a Samhain Ritual, and so much more! Northeast Georgia's biggest Pagan festival ever! Don't miss out on the biggest event of the year. The event is an all day affair from 9am each day until midnight with a full schedule of events for the entire day! A spectacular event for the entire family! All this sounds wonderful ...doesn't it? To make it happen I need your help. The North Georgia Pagans are in the planning stages of next years Samhain Festival. We are seeking all which are interested in becoming a vendor, healers, speaking, teaching, holding workshops, readers and musical performers ...and more. For more information please contact me, Grandfather Oak. This omelet makes 4 servings. Chervil symbolises new life and hope. This herb resembles parsley in shape and texture, although has a finer leaf and has a gentle anise flavour. It is also high in Vitamin A and C.
In a large frying pan heat the oil over medium heat. Add the green onions, pepper and mushrooms and cook for 5 minutes. Remove the vegetables to a plate and reserve for later. In a mixing bowl whisk together the eggs, cream, salt and pepper. Pour the egg mixture into the frying pan and sprinkle the reserved saut�ed green onions, peppers and mushrooms on top. When the eggs are firmly cooked sprinkle the chervil on top then fold the omelet in half and place it on a large serving platter. Cut the omelet into 4 pieces.